I am having a workshop tonight and this is one of the items we will be making. I will show the other items in tomorrow's post. I have two ladies coming who are first-timers and I'm sure this will be fun for them to create. If you need any Stampin' Up! 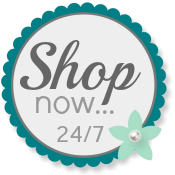 You can order from me 24/7 by using my website. Don't forget that TODAY is the last day to order the Filled With Love Bundle. Details here. Beautiful card. Love the textured background you used. I'm bummed this is the last day for this set! Gray is the new black - looks wonderful with your pink and red! I love this set! Love, love, love the banner! I am sure they will have fun creating this beauty! Have a fab workshop! Love it!! Your guests are going to have a blast creating this card. Good luck at your workshop!